Bon Jovi kicks off another leg of their Circle tour in New Orleans tomorrow, 30 April, but unfortunately Richie Sambora won't be joining the band - at least for a while. It was announced yesterday that the guitarist has entered rehab to treat a drinking problem. A yet-to-be-disclosed guitarist will be filling in for Sambora temporarily on the tour which is expected to conclude 31 July in Lisbon, Portugal. Bon Jovi released a statement in which they said, "Our support for Richie is absolute. He is, and will remain, a member of Bon Jovi. Although he will be absent from upcoming shows for the time being, we very much look forward to his healthy return. In the meantime, we will keep our commitment to our fans and continue our tour." 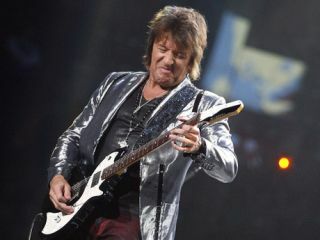 According to a source who spoke with Radar Online (no affiliation), Sambora is being treated at an undisclosed facility because he "recently has been drinking too much, and wants to get his life together." Richie Sambora has been a good friend to MusicRadar and its readers, and we wish him all the best in his recovery and look forward to seeing him back on stage soon.